EverLast™ is only available from a certified installer in your area. Contact us to request an inspection & get a free cost estimate to have it installed in your home. 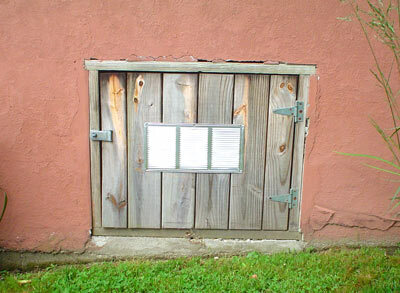 Controlling what goes on in your crawl space begins with the crawl space door. 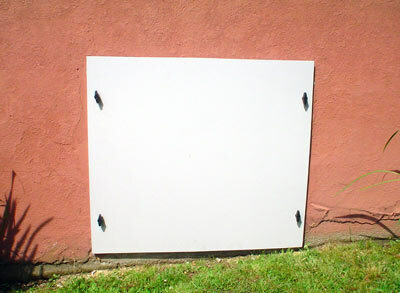 Too often, a crawl space door is simply cut from a piece of plywood and secured loosely over the crawl space opening with hinges or screws. Drag the arrows left and right. From bad to best. Replacing a leaky, deteriorating wood crawl space door with an EverLast™ Crawl Space Door is a smart upgrade. Unfortunately, this treatment allows insect and rodent pests to enter the crawl space, along with cold winter air that can make your floors frigid. To make matters worse, wood will crack, warp and deteriorate over time, requiring repainting or even replacement. Wouldn’t it be better to have a crawl space door that seals out troublesome intruders, looks attractive and requires no maintenance? EverLast™ crawl space doors from Basement Systems are made from ½-in.-thick PVC plastic that is just about indestructible. Several different door colors are available to help you match your home’s exterior color scheme. Standard sizes are available, but your Basement Systems contractor can also order and install a custom-size door. Small doors are usually installed with a couple of weatherproof threaded knobs that come with the door. Larger doors require 4 knobs. Unlike wood crawl space doors, EverLast™ doors will never warp, crack, shrink or require maintenance or painting. An air and water seal is certain, thanks to the heavy-duty weatherstripping that comes with each EverLast™ door. Once you tighten down the installation knobs, you can feel confident that the interior of your crawl space is protected and fully isolated from exterior critters and conditions. We offer a wide range of crawl space products, designed to provide you with a dry, healthy crawl space. Get a free quote to replace your crawl space door! Whether you need a replacement crawl space door or you are installing a crawl space door on a new home, contact us today for a Free Estimate!